This page is updated often, so please check back soon for more good stuff. Webpage Updates! Check them out! Our Most Recent Engine Purchases & Projects! Always looking to buy old single cylinder engines, tractors, and literature (pre-1930), so if you're looking to sell anything interesting please EMAIL-ME! Hi! Welcome to Chris and Rod Epping's antique tractor and engine homepage. We live near Funk, (South Central) Nebraska. My dad has been collecting for many years now and I joined him in the hunt for old iron a few years ago. We collect Rumely, Aultman Taylor, Case, Minneapolis, Avery, Advance, International, and other old pre-1940 tractors. We also like antique stationary engines including Otto, Gade, Moguls, and any other OLD engines or any sideshafts. Please look around a bit and email me if you'd like to talk old tractors or engines. Also, PLEASE sign my guest book, and include your favorite tractor and/or engine. The Rumely company was one of the largest tractor companies of its time. In our opinion the Oilpull was the "Ultimate Tractor." Their tractors were way under rated (the rated 30-60 'E' was tested by Nebraska tests, and it actually put out about 50 horse on the drawbar). As you can see, we've dedicated a good part of this page to the Rumely company (and the companies that merged to create it, such as Aultman Taylor & The Advance Thresher Co.). We hope that all you Rumely enthusiasts (or to be enthusiasts) enjoy this page. 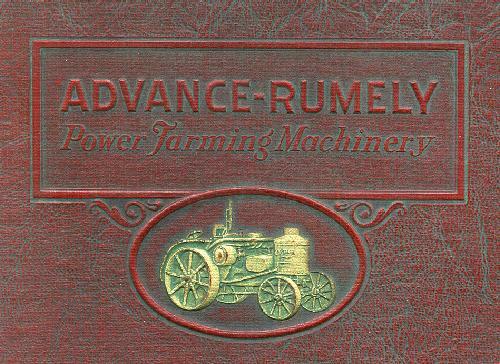 The M. Rumely Co. & the later Advance-Rumely Co. made many different products which helped shape the world of agriculture. Some of these products are listed below & featured throughout this website. Information on these products can be found on the Rumely Products Page. Please follow the links below for lots of great tractor & engine information, pictures, history, and advertising. Rumely Features Page! Shows, Shop Work, & Just Playing Around! looking for & it will give you the pages where your keyword appears. I'd enjoy talking to anyone interested in old tractors or engines! So DROP ME A LINE BY CLICKING HERE. person here since April 26, 1999.